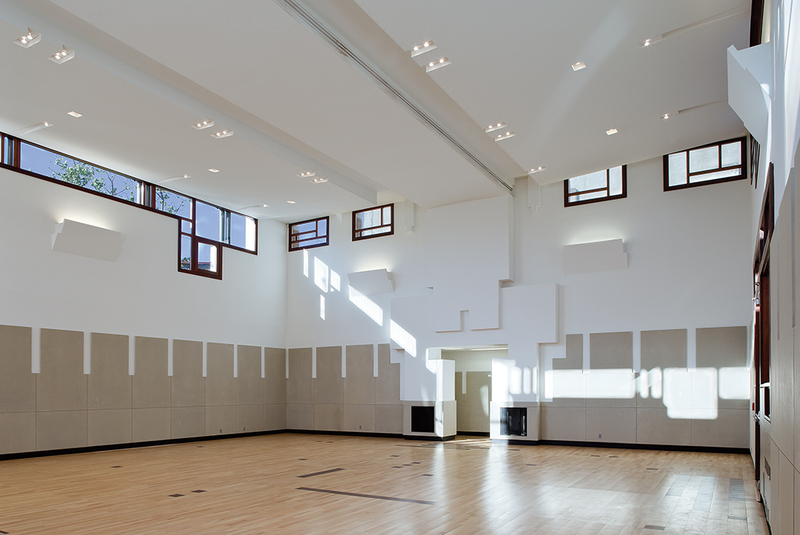 George Ranalli Architect completed Saratoga Avenue Community Center, in 2010, for client-agency NYCHA. The project included renovation of 1,500 square feet of existing ground-floor space, inside the existing 16-story apartment tower, to accommodate youth technology programming and community use, and a new 3,500-square-foot building, including a commercial kitchen, director’s office, bathroom, storage, and other amenities, for year-round, all-purpose community uses, ranging from summer camp to wedding celebrations. 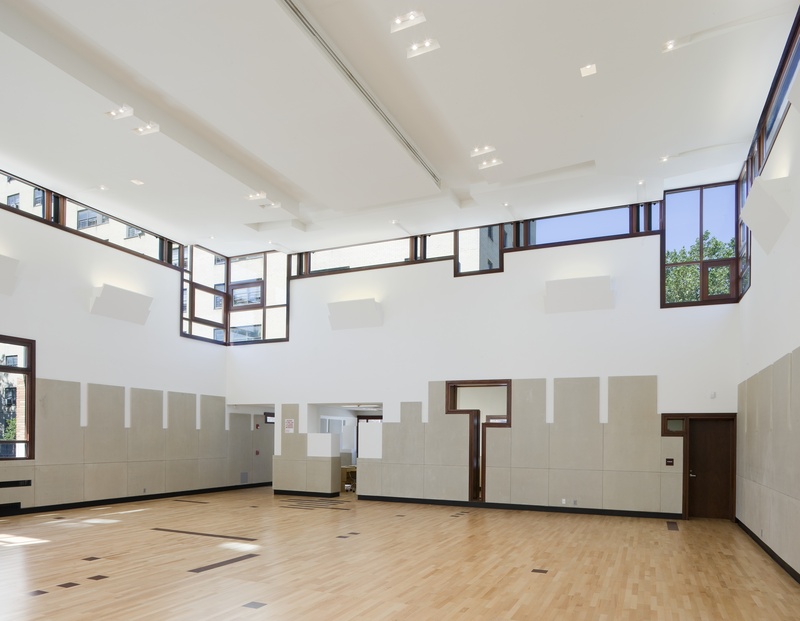 Saratoga Avenue Community Center presented the community an alternative to typical public architecture, built by a municipal agency, which is bland, stark, and alienating to occupants. 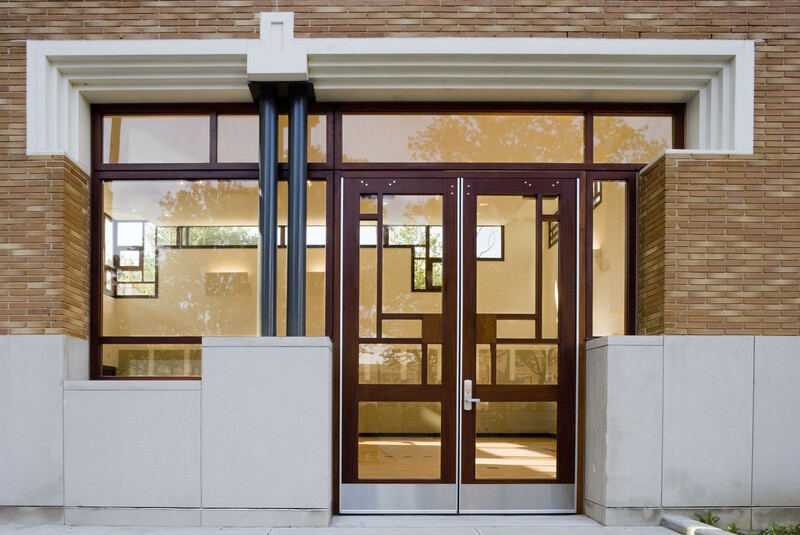 Saratoga Avenue Community Center transformed a solitary asphalt site, on a residential housing super-block, into a functional and useful place of distinction. The orientation and design of the new building, and the redesign of the the existing high rise tower ground-floor space, and its surrounding landscape architecture, organized and brightened the entire setting. At the eastern end of the site, a new corridor marks a pedestrian pathway connecting the apartment tower and new community center, unified further by an exterior sheltering street wall, and the smaller of two volumes delineating the new community center, used for the director’s office, anchors the site to the west. The new interior courtyards around the community center now become inviting outdoor green-space – one bordering Hancock Street, and another, at the front of the Community Center’s main entrance. 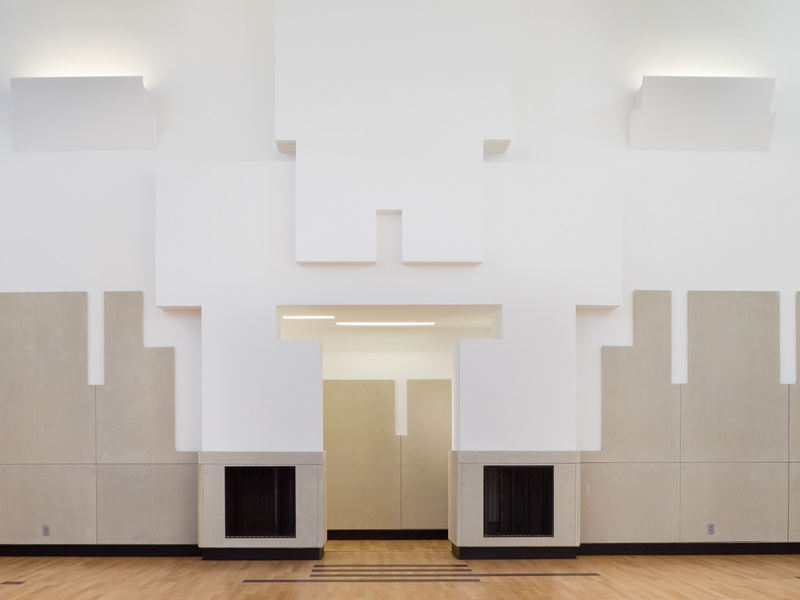 In metrical progression, access to the Center, either from the public sidewalk, or through the corridor adjoining Saratoga Houses, into a compressed entryway which opens into a soaring 23-foot-high main space. Hardwood flooring, and durable buff-white wainscoting, gleams and glimmers, in reflected light, and large mahogany-framed, clerestory windows encourage the view upward. 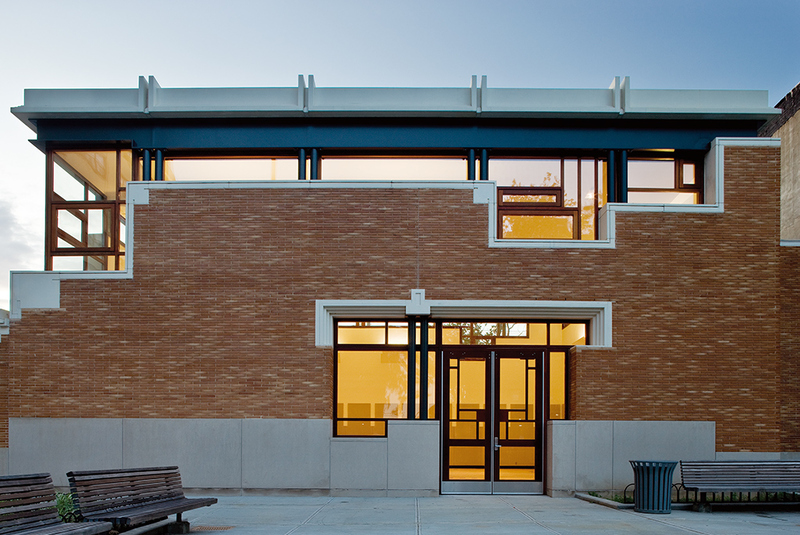 Saratoga Avenue Community Center is a solid speckled roman brick structure, over a limestone base. It synchronizes well with the tan brick of the Saratoga Houses tower, without resorting to mere replication. but its composition of varied materiality, transparency, and density, much like its interior, offers an intangible sense of luster. The facade is carefully adjusted in certain places, some incised, other more deeply recessed, to engage the dynamics of shade and shadow. 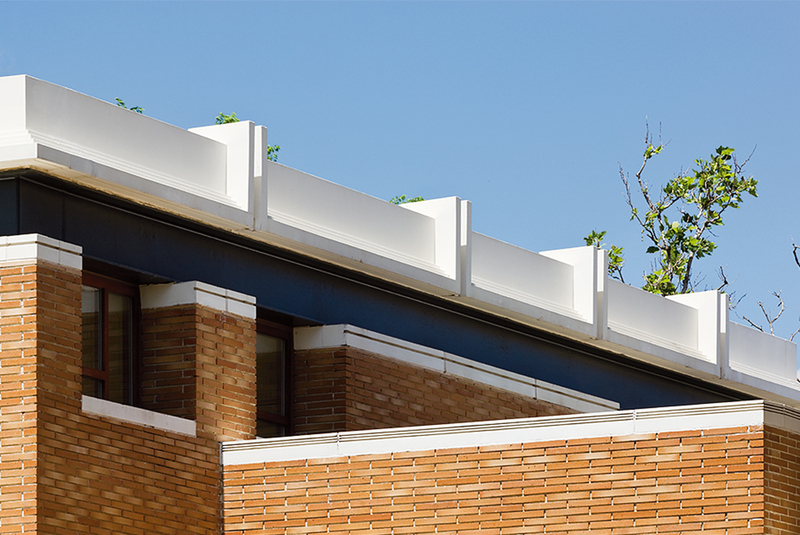 All the while, the architecture stays mindful of the cost of construction, utilizing pragmatic construction methods, such as precast technology, no expense to conceptual integrity or beauty. Empowering Architecture. Saratoga Avenue Community Center. George Ranalli Architect. Harvard Magazine. An Oasis in Limestone and Brick. 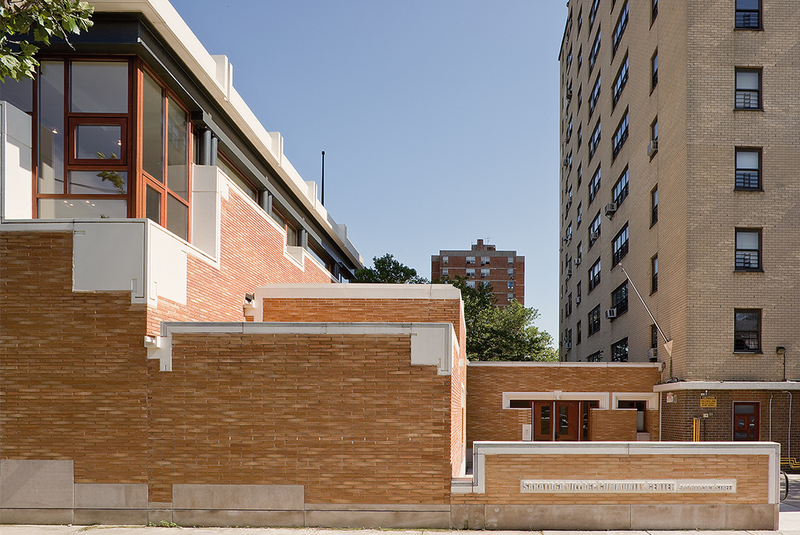 A Community Center Grows In Brooklyn. 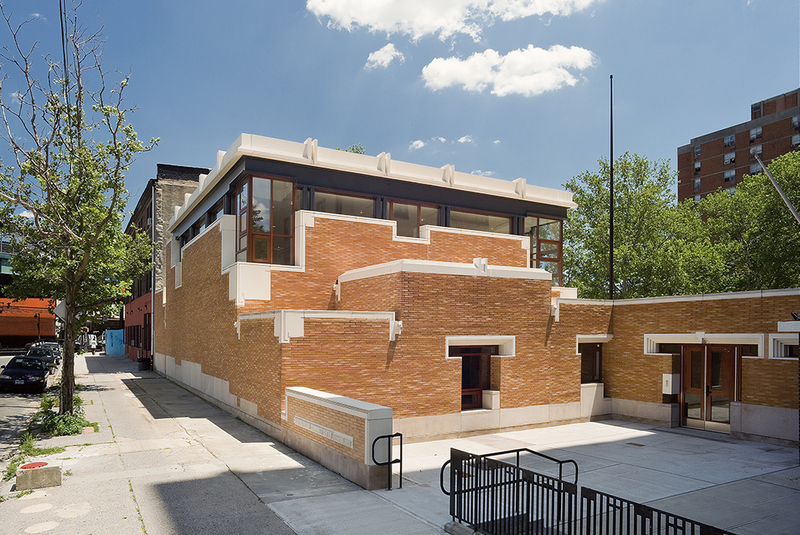 POSTINGS: Bedford-Stuyvesant Community Center; In Brooklyn, A ‘Beacon’ Recalls Wright. Picture Gallery : Telegraph, UK. Saratoga Avenue Community Center. George Ranalli Architect.